One of the fun and fascinating things about family history is tracking where your ancestors lived. Within my family, we always think of the Wolford’s as being a clan from Topeka, but if you trace them back far enough, you find that they didn’t live that far from Youngstown. 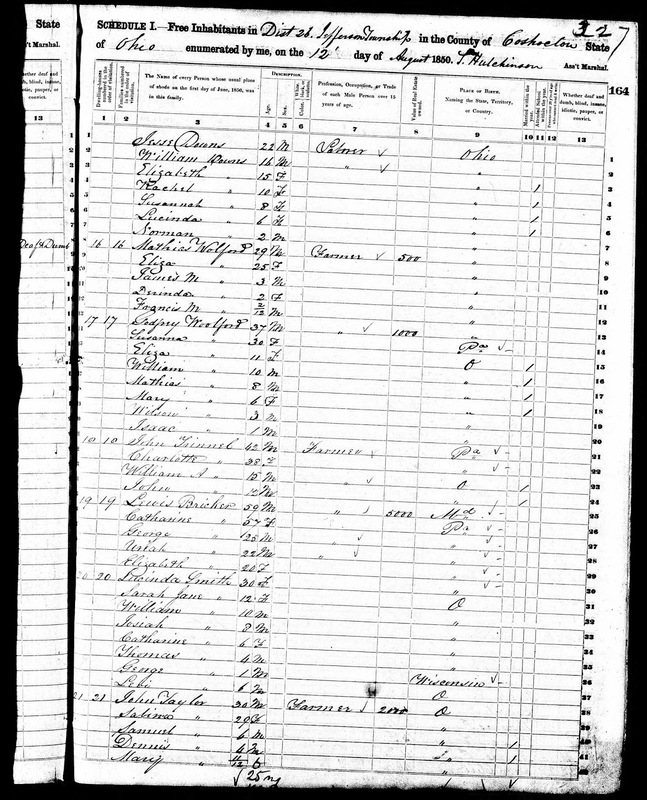 The 1850 U.S. Census shows several Wolford families living in Jefferson Township, Coshocton County, Ohio. The 1850 Census was the first to list each member of the household. Previous census records only listed the heads of the household and the number of people living there. With the additional names, it’s much easier to track family lineage. The 1850 Census shows two Wolford families farming side by side. My 4th great grandfather Mathias Wolford and his family owned $500 worth of land while his brother Godfrey Wolford lived next door on a much larger plot, valued at $1000. In 1850, Jefferson Township was becoming a very suitable place to live, as the newly built Walhonding Canal provided a link to the larger Ohio and Erie Canal and eventually, the Great Lakes. For farmers and 3rd generation Americans Mathias and Godfrey, the canal system would have provided a relatively inexpensive means of transporting goods to market and returning farming equipment to the homestead. Mathias Wolford household, 1850 U.S. census, Coshocton County, Ohio, population schedule, Jefferson township, page 327, dwelling 16, family 16; National Archives micropublication M432_670. Ancestry.com; Page: 164A; Image: 333. Link. Accessed 13 Jun 2013.